I have never canned before. Apple Butter is some of the best home canned goodness I can remember from growing up. I will be tackling that soon...you can count on that for sure! So I have to make every rhubarb stalk worth something this spring. I decided to tackle making a jam. Made a trip to my Grandpa's one afternoon and raided the mason jar stash under the basement stairs (some of which still have canned goods in them from er, well at least 12-13 years ago), then headed to Walmart to get new seals and bands, because, well like I said, they are fairly old. Now I'm new to canning, and I did a lot of reading and trying to remember how to do it. That's why I chose this recipe out of the ol' Richards' Recipe Box (my maiden name is Richards), it is super simple and virtually foolproof. The best part is that it is delicious!! Wash jars out with soap and water. Fill a large stockpot with water, fill the jars at least 1/2 full with water. Place in the stockpot, along with the seals for the jars. Bring to a boil for a few minutes, then reduce heat and let simmer while preparing the food for canning. Its simple, the Ball website has way better tips and how-to's, but this is the just of it, and it worked out well for me. Makes 2 pint mason jars, or 4 half-pint jars. 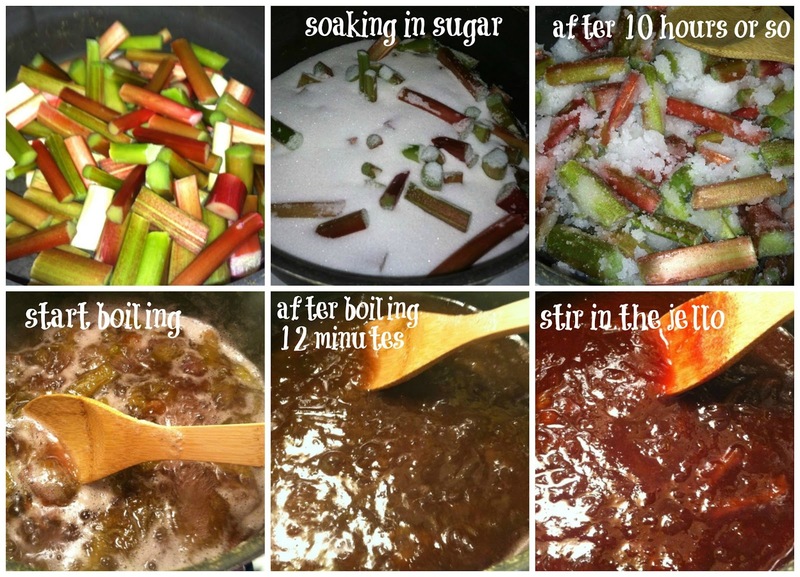 Place rhubarb and sugar in a medium-size saucepan with the sugar. Bring rhubarb and sugar to a boil over medium heat. Stir constantly for 12 minutes while at a boil. Stir in the strawberry gelatin. Seal and turn jar upside down on a dish towel for 7-9 minutes. Touch seal, it should have sealed and will not move. If it does, repeat turning upside down. 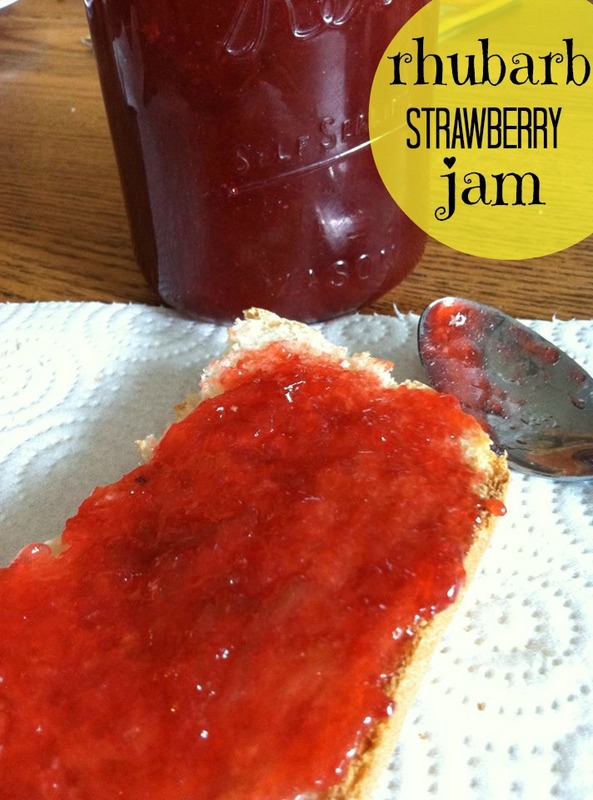 The jam will need to sit for at least 24 hours to cool and set up. I have gotten some emails asking what the rhubarb should look like during the process. Should I chop the rhubarb into tiny pieces? So I took some photos of each step the last time I made this. Hope it helps!